Mr. Rhett is our own Babe Magnet. He and his sister Miss Scarlett are rescue kitties but expensive ones. They were donated to an auction held by Nyssa's school when they were only about six weeks old. Apparently their mother had died and the people didn't know how to take care of the kittens. Their little bellies were distended from malnutrition. I was the only person who really wanted them but another mother started bidding to get the price up. It got up to $60 before she realized that the auctioneer was doing the bid at $60 each instead of for the pair. I think they have been worth the $120 and it was for a good cause. Mr. Rhett and Miss Scarlett, true southern names....actually all our cats are called "Mr." and "Miss". Not by our naming but by the deep southern tradition I first saw at the vet. He calls all the animal patients with these prefixes. Mr. Rhett has earned his title of "Babe Magnet". He loves women, any size, any shape, and any age. He stares genteelly at them with big round "moony" blue eyes but keeps a respectful distance unless first beckoned. 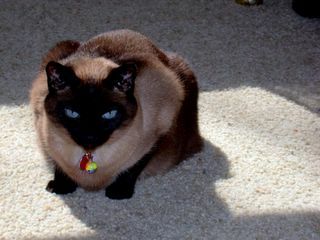 Almost every woman who came to our home would ask later, "Who was that cat with the dreamy blue eyes?" Mr. Rhett loves bathrooms. He loves to sleep in the oval sinks (dry) and he loves to sit on a cabinet opposite the shower while it is occupied. If you shower a bit longer than he thinks is acceptable, he will cry. If you sing in the shower he will sing with you. His favorite song is (of course) "The Three Little Kittens Who Lost Their Mittens"; he comes in at the end of each phrase. His other passion is "clean naked bodies", he wants to touch you right after you have stepped out of the shower and dried, he kneads on your shoulder and rubs his head on your arm to get your attention, purring deeply all the time. I may have earned the title of "Mommy" for Rhett but he has one everlasting and overwhelming true love in his life.....Michele. She would housesit for us and if she took a nap she would wake to find him next to her on the bed, again respectfully distant but there. When she closed her eyes he would reach a paw across and gently touch her face. As long as her eyes stayed shut his paw would stay put, but when she opened her eyes he withdrew his token of affection. He adores her, seeks her out when she visits and sits by her, on the couch, on the ottoman....content to just touch her with a paw or if permitted to lay his head on her lap. He truly lives up to his namesake, suave, mysterious, very Clark Gable. To see other pictures of cats and dogs and squirrels..Oh! No!...be sure to visit Friday's Ark a posting of Friday Animal Blogging.